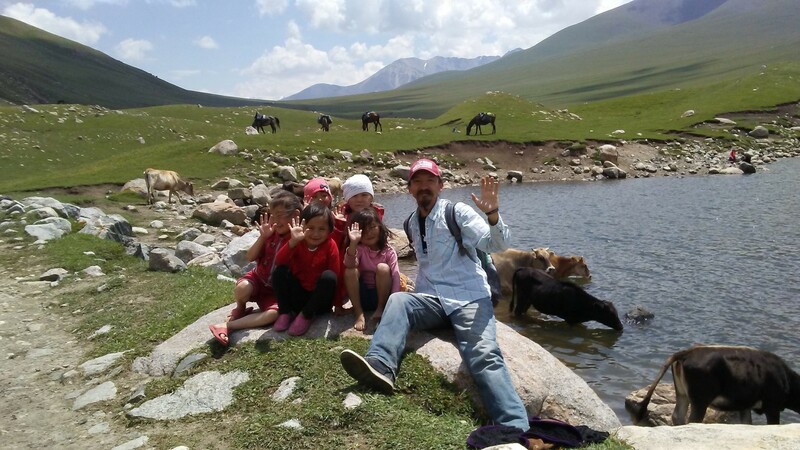 An SRAS student poses with local children while exploring the Kyrgyz countryside. Bishkek is set amid the rolling hills and soaring mountains of Kyrgyzstan, a country rediscovering its identity and long history filled with nomadic traditions. Kyrgyzstan is also maintaining its heritage of bilingualism: Kyrgyz is common in homes while Russian is most common on city streets. For students of Central Asian Studies, Bishkek is an excellent vantage point for understanding a region that is growing in geopolitical and economic significance. For anthropology students, Bishkek is fascinating: a society that has seen both rapid development and the preservation of traditional nomadic lifestyles. For students learning the Russian language, Bishkek offers a unique, immersive, and highly affordable experience. Kyrgyzstan is a relatively poor country. Although Bishkek is green and pleasant to walk in, you will notice uneven sidewalks and potholes, unpainted concrete buildings, and often poor street lighting. At the same time, the people are generally friendly and the taxis are cheap via apps like Yandex Taxi, meaning that you don’t have to walk alone at night. Bishkek is sunny most of the year, with a few grey winter months. Bring a good hat and sunscreen. Between ice in winter, bumpy walkways, and numerous outdoor adventures, you’ll also want boots with good traction. Summers are hot and air conditioning is not standard. Bring light clothes and a swim suit. Winters are cold. Heat is provided by city-wide systems, but you’ll also want to come prepared to spend a lot of time outdoors, with the ability to dress in layers. Bishkek is friendly and fascinating. It’s surrounded by beautiful nature to explore. While its recent history has been turbulent, its people remain open, proud of their heritage, and willing to work for their future. For more on the history of Bishkek, see this article on GeoHistory, also part of the SRAS Family of Sites. The following list is a quick list of recommendations based on SRAS’ long history in Bishkek. It is meant to supplement the broader range of reviews on this site for various Bishkek eateries. Central Asian Experiences: Chaikhana Jalal Abad specializes in Central Asian dishes: plov, lagman, and especially besh barmak. Also try Faiza, a cheap but very high-quality restaurant serving traditional food near the London School. The closest traditional Central Asian restaurant to the school is Navat, an ornately decorated restaurant and with a higher end, but reasonably priced menu. Ubiquitous столовая (cafeteria)-type cafes also offer very cheap, and often quite delicious, food—check out the one right across the street from Vefa, which has a good lagman. Don’t be afraid to grab a samsa (meat or potato pie) or some manti (meat dumplings) from a stall at the bazaar while you’re doing some shopping. Finally, a convenient perk of the London School is its own on-site cafeteria, where friendly local ladies serve up homemade plov, soups, dumplings, potato or meat pies, with a cup of tea or instant coffee. You can eat a hearty lunch or snack in the courtyard between classes for about a dollar or two. For the Homesick: Metro Pub – also known by its former name of “The American Bar” – has Bishkek-style American and Mexican food. The place has seen better days, but if you take a place at the bar you’re likely to encounter a few expats. Burger House is almost an exact copy of Shake Shack, and they will probably insist on speaking English to you. For full-on American diner (in retro-50s style), try Rick’s. You might also check out our Students Abroad entries by student Cian Stryker, who put it upon himself to try as much American food abroad as possible. For southern border cravings, there is a tiny buritto stand located near London School or try Chili Pepper’s or Obama Bar and Grill, which serve American and give Tex-Mex their best shot. Coffee: Bishkek’s coffee scene is improving daily. Coffee shops close to the London School include Cave Coffee and Traveler’s Coffee, both with large coffee and tea menus, a decent selection of food, and free wifi. Sierra Coffee is another good, very Western alternative, complete with soy milk alternatives for your coffee and attractive brunch-type menu options. Other recommended coffee spots include Adriano Coffee and Bellagio Coffee, both chain coffee shop/cafes. You’ll notice new spots popping up along the main streets and in the microregions all the time, making plenty of attractive options available for coffee lovers to explore during your time here. For Music: A favorite among Bishkek college students is Old Edgar, a cozy spot that features good food, nice atmosphere, and live music in the evening. Chicken Star is great for their food (Korean fried chicken), company (everyone is very friendly there), and frequent concerts. Blonder Pub (24 Ibraimova) also often has live music. Add Somewhere Bistro (Jibek Jolu 487), a popular expat spot, for live music on the weekends and trivia night on Wednesdays. For more places, for those who speak Russian, catch up on the “in scene” for modern music in Bishkek at Rock.kg. Also check out this Guide to Bishkek Nightclubs. Specialty Tastes: Mimino specializes in reasonably priced Georgian food, but the local favorite for Georgian is without a doubt Cafe Pur-Pur (a bit more expensive, but worth every penny for its authenticity). Steinbrau offers freshly brewed beer and German dishes, plus local favorites like shashlyk. Yusa has freshly prepared and reasonably priced Turkish food and is a favorite of the embassy set. You can also find cheap and delicious Turkish cafes on the third floor of Vefa center for good take away or a quick sit down lunch/dinner. Sarya, a Syrian café, has delicious, inexpensive vegetarian options like falafel and hummus. Bishkek also has a variety of Asian cuisine like Baan Baan Thai Cafe and Japanese restaurant Furasato, both wildly popular with expats and locals alike. Kyung Bok Kung offers great Korean food, and makes vegetarian bibimbap with tofu upon request and Cooksoo does Korean noodles, right next to the London School. Korean is easily the most popular international cuisine in the city, so don’t limit yourself to our two recommended options. For an amazing 3 dollar Indian lunch buffet, try the Host, or Salame Namaste for a sit down Indian dinner after a shopping trip at Osh Bazaar. U Mazaya is a small, cozy, grotto-like restaurant that features rabbit dishes. You can also find a number of Italian restaurants and pizza places throughout the center, notably DoDo Pizza, Cyclone, Dolce Vita, and Mario. Lastly, there are lots of cheap Chinese restaurants around Tsum and close to the Circus; look for the telltale red lanterns out front. Vefa Shopping Center will likely be your source of most things you need day-to-day, it’s a large shopping center near the London School. Groceries: You can get most things you’ll need at Frunze, a large grocery store on the first floor of Vefa Shopping Center. For the largest selection of food in western style supermarket format, try Globus (many locations all over town) or Alma in TSUM. Narodniy is good if you are looking for low convenience and don’t need any fresh produce, 7 Дней (7 days) is good for convenience and sometimes surprises you with international food options as the closest location to the London School (Y. Abdrahmanov St and Sovetskaya) is near international student housing. Berlin specializes in imports from Europe and the US (think Tobasco sauce, European beers, ranch dressing). For vegetarian and healthfoods, try Ecoland (just across the street from London School) or Goin, a Chinese market where you can buy tofu, soy sauce, produce, and lots of loose-leaf tea. Tofu is also readily available at most bazaars and other helpful items like affordable dairy-free milk can be found at Globus, Alma, or 7 Дней. For any other tips on eating and shopping meat-free in Bishkek, check here. Malls and Bazaars: See our Packing Guide for things you should bring with you. For higher-end clothing and shoes, try boutiques nestled into the colonnade near Ata-Too square. In addition to Vefa and TsUM, you might also try Karavan for shopping malls. Asia Mall is also a new, westernized mall with a luxury Frunze grocery store on the bottom floor and many nicer shops above. If you want to hone your bargaining skills, head to Osh Bazaar or Orto-Sai Bazaar which offer a whole bunch of things: clothes, shoes, cheap plastic goods, DVDs that may or may not be pirated, and souvenirs. Electronics: The Planeta Elektroniki has some electronics and offers computer repair. There are several small electronic stores in Vefa and TsUM has almost a whole floor devoted to electronics. There is an authorized Apple retailer in town too. For everyday electronic needs (phone chargers, USB cords, power strips), large grocery stores and most bazaars will have everything for your more basic needs. For kitchen appliances and home electronics try stores like grocery stores like Globus, the aforementioned Planeta Elektroniki, or (you guessed it) the bazaars. Pharmacies: Bring a supply of needed medications with you, but don’t be concerned if you forget some general medications like ibuprofen. If you need something, look for the international symbol of a green cross or the word “аптека.” If looking for something specific, try looking it up on Wikipedia in English and then clicking on “Russian” in the language menu on the left panel. Here you can get many things without a prescription such as antibiotics, just know the local chemical name for it when asking (ask locals or the Expat page about specific names). If you catch a little bug and aren’t sure what you need, you can explain your symptoms to the pharmacist and they will gladly advise you on what you need. Eyeglasses and Contacts: Just like pharmacies, you can find “Ochkis” on most streets. These are small stores where you can buy all things glasses and contacts as long as you can tell them your prescription strength, no actual prescription needed when you ask. There you can also buy contact solution over the counter. Glasses are usually about a fourth of the price here than in the US and a contact supply for three months with run you about 10-15 US dollars. The quality here for contact lenses is not as good as the US, but they are safe and get the job done. Sports: You can find basic sports equipment at the large grocery stores such as Frunze, Alma, and Globus. Sports culture is not terribly popular in Bishkek, but you can occasionally find pick up basketball and soccer games on the Expat facebook page. Rumor has it that the students at the American University in Bishkek have some intramural type teams that anyone can join. Souvenirs: The fourth floor of TsUM and the second floor of Beta Stores at Chui 150 have convenient, if expensive souvenirs. Head to Osh Bazaar for best prices and selection. See this Guide to Souvenir Hunting in Bishkek for more information. Arts and Crafts: Arts and crafts supplies can be found at large western supermarkets like Globus or at the school supply shops and stalls in the underground passageways/pedestrian crossways at the intersections of Chuy and Sovetskaya (Baitik Baatira) near TsUM and the Ala-Too square. Reading: Raritet is the city’s largest bookstore, with maps and a few English-language books, plus English-Russian dictionaries. There are cheaper Russian-language books on the fourth floor of TsUM. Bookingham is a small bookstore/stationary store near London School. Cell Phone and Mobile Internet: For more on this, see our Guide to Student Budgets: Bishkek. Free WiFi is avaliable in the Beta Stores and in most restaurants and cafes (look for the telltale WiFi signs in windows). Public Transport: To navigate the city, 2GIS is available in app stores and favored by locals. 2GIS provides an offline map of the city and will plan your route using whatever type of public or private transport you desire. Bus.kg and the downloadable app there allow you to view all Bishkek’s bus routes, as well as plan out your transport from point A to point B via marshrutka, bus, and/or trolleybus. Tips for transport: on marshrutkas, you pay your fare when you get in the van, for busses and trolley busses, get on through the back doors and pay when you are getting off. Local culture dictates that one must surrender their seat to mothers/grandmothers with kids, older folks, or anyone carrying bags on public transport. Private Transport: Taxis can be hailed from the Yandex, Namba, or SMS taxi app. For bicycle rentals, there’s VeloPro, where you can rent a bike by the day or hour. For mountain bikes, try FreeBike. If you would like to traverse the city by cycle, be aware that bike lanes do not exist and biking on the sidewalks can be a risky business as locals tend to meander without watching for cyclists. Post: The main post office is centrally located at the corner of Sovetskaya and Chui. You can purchase stamps and mail letters there. For shipping or receiving packages or important documents, try the local FedEx or DHL, as they are nearly always faster and safer to ship things with—though quite expensive. For opinions on the best/quickest/cheapest shipping options to and from Bishkek, join the Expats in Bishkek facebook group to search or ask questions related to this matter. Computer Repair: The Planeta Elektroniki has some electronics and offers computer repair. Banyas come in handy especially if you are in Bishkek when the city supply of hot water gets turned off for maintenance. Try Zhirgal Banya or S Legkim Parom Spa Complex for a good, reasonably-priced cultural experience. Some good tips for first timers: bring a towel to dry off with but use the bed sheet-like material they give you at the door in the actual saunas, bring snacks or even a picnic with you, always bring water and your own shower supplies – but don’t worry if you forget something, you can always buy it at the banya! A normal 3-4 hour session with a few extra add ons like tea, a sheet, and a birch branch will run you around $8. Barber Shops/Hairstylists/Salons can be found on every street corner of the city, especially around the London School. If you spot one that looks good, jot down the name to look them up online to call to make an appointment or find them on Instagram (Bishkek’s primary way of doing business) and DM them for appointments. Or stop in then and there to ask about availability and make an appointment for a later date in person, if you feel comfortable. All of this information on appointment making holds true for other beauty services as well (nails, waxing, eyelash extensions, massage). Haircuts come in around $5-10, shellac manicure around $8, message around $20. Charitable giving: Try Реабилитационный центр “Оберег” для детей и молодых людей-инвалидов or Детский дом “Путник.” Other opportunities to give to local charities and volunteer can be found through religious organizations such as International Church Bishkek, which works with and funds several charities, or the local Jewish center, which runs a soup kitchen. Laundry/Dry Cleaning: Try Eco Dry for reasonably priced services. Medical Care: If at all possible, call your insurance before seeing a doctor. See this page from the US embassy for various doctors and clinics. For dental needs, try Vita Dent or The Diplomat Dental Salon. For a Chiropractor, see Dr. Fudashkin at the Family Medicine Center. Gyms: There are several gyms offering aerobics, weight training, and swimming. The closest facilities to the London School is Fitness House and Flex KG which is located in Vefa center. Karven Club offers generous discounts to International Student Card holders. Lovely Mama offers yoga, kickboxing, and other interesting fitness classes. Also close to the London School is Yoga Dom Atmi, which is popular with those who routinely practice yoga and are looking for classes with a range of yoga types and degrees of difficulty. Recommended Banks/ATMs: You’ll want to be careful about what ATMs you use in Bishkek. Those run by Demir Kyrgyz Bank all offer exchange, ATM, and cash advance. The Kazkommerzbank ATMs, including the one at TsUM, are also a safe bet.